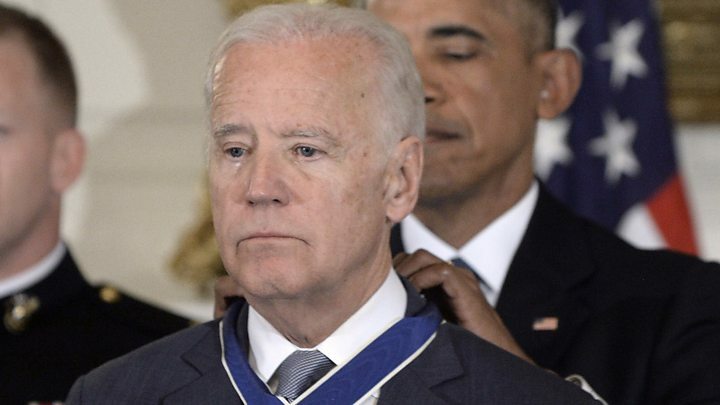 President Barack Obama has awarded an emotional and surprised Joe Biden the Presidential Medal of Freedom, the highest US civilian honour. Mr Obama praised his vice-president for his "faith in your fellow Americans, for your love of country and your lifetime of service". The award comes as both men prepare to leave office when Donald Trump is inaugurated on 20 January. Mr Biden has said he plans to stay active in Democratic Party politics. A visibly emotional Mr Biden stood by as Mr Obama heaped praise on what he called the "best possible choice, not just for me, but for the American people". The medal was awarded with distinction, an additional honour that has been reserved in recent administrations for just a handful of recipients, including Pope John Paul II. Mr Obama joked that the internet would have one last chance to mock the pair's "bromance". Mr Biden said he was "part of the journey of a remarkable man who did remarkable things". The vice-president, who attended with his wife Jill, said that he had had no idea the award was coming. Image caption Mr Obama joked this was one last chance to mock their "bromance"
"I had no inkling," he said. "Mr President, I'm indebted to you. I'm indebted to your friendship. I'm indebted to your family." Citation: "An especially meritorious contribution to the security or national interests of the United States, world peace, cultural or other significant public or private endeavours"
Mr Obama said that Mr Biden's career was "nowhere close to finished" both at home or abroad. 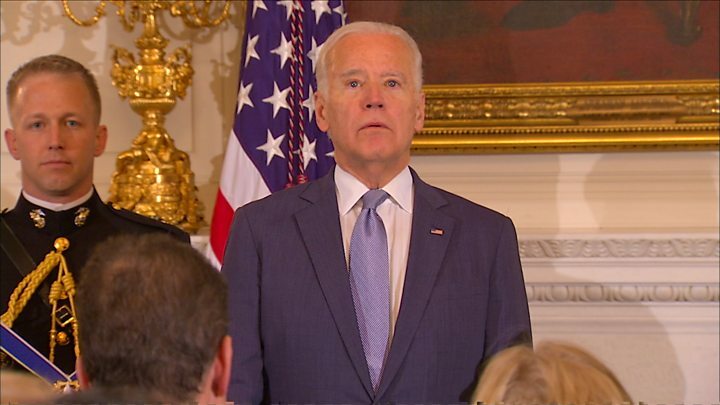 Mr Biden has said he plans to work on policy issues at the University of Delaware and University of Pennsylvania, and to continue his efforts to tackle cancer, which claimed his son Beau in 2015. Earlier on Thursday, Mr Biden gave an hour-long interview with media outlets in which he strongly criticised Mr Trump for his condemnation of the US intelligence services. "It is really very damaging in my view to our standing in the world for a president to take one of the crown jewels of our national defence and denigrate it," Mr Biden said. "It plays into, particularly now, the Russian narrative that America doesn't know what it's doing." However, he was full of praise for his successor, Mike Pence, saying he had sent him memos on how to handle certain situations.